Photos of Year 4 's slippers - many thanks to Mrs Staddon who deserves ALL the credit for teaching the class sewing skills. 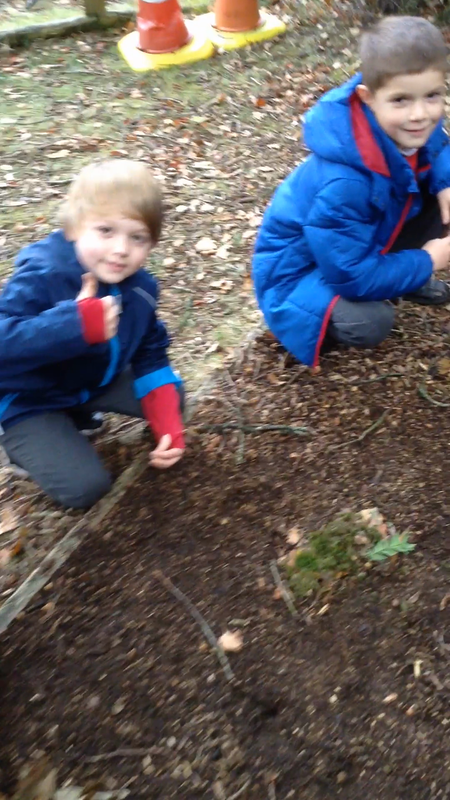 Outside in the woods making our own Autumn/Winter designs using natural resources. Year 4's electrical toys - a question and answer game. Even more Roman clay designs ! Year 4's Roman clay designs. If there are any parents out there who know anything about sewing and would like to help Mr McLaren (he is desperate for ANY help ! ), Year 4 will be sewing every Monday afternoon from 1.30pm until 2.15pm. We are planning to make our own pair of slippers ! Mr McLaren has got all the equipment such as needles, thread, felt, pieces of sponge for the soles; the only things he hasn't got are...sewing skills ! This is Year 4 ! Happy new year ! Welcome back to an exciting new Half Term. Here is an overview of what we will be learning this term. In English, we will be focusing on usind a variety of sentence starters. We will be watching short clips to inspire us, identifying their different features and building up a "toolbox" to use when writing our own. We will be focusing on using rich vocabulary to make our writing come alive as well as using a range of sentence structures/sentence starters to create different effects. We will be carefully considering our choice of punctuation and editing our work to ensure we have spelt words correctly. We will be continually improving our handwriting and presentation. We will be continuing with "Reciprocal Reading" which involves the class book, 'Journey to the River Sea'. As always, these topics will involve fluency, reasoning and problem solving skills. By the end of Year 4, we should be able to recall multiplication and division facts for multiplication tables up to 12 x 12 and also be able to count in multiples of 6,7,9,25,1000. In Year 4, our Homework is on a 3-weekly cycle; this includes practising and learning for our weekly Spelling and Times Tables tests which we have on a Friday. Spellings Log books go home every day and you can share your child's weekly spellings and the words that we are looking every day of the week. In our class, we bring in our Reading Diaries every day. We aim to improve our reading and develop a love of reading, by reading a wide range of texts. Therefore, we need to make sure we are reading every night at home with a member of our family. PE will be on Tuesday. We will be covering Rugby skills which involve carrying the ball, supporting the ball carrier, passing and receiving the ball, dodging and small-sided games with tags. Languages - Spanish - We are trying to learn Spanish this Term. It will link in with our DT topic and our Geography topic. Areas that we will be looking at include: numbers, days, months, greetings, weather. Wish us good luck ! DT – We are looking at a famous Spanish architect called Antoni Gaudi. His designs are in Barcelona and include: buildings, roofs, bridges, steps. Check them out on Google - they are AMAZING ! Computing - finding and using information to put in a presentation plus using the i-pads to have a go on the TT Rock Stars Times Tables Challenges. This week, Year 4 has been making guitars as part of their 'Sound' topic. Their classroom was an absolute mess with the pom poms, stickers, lolly sticks and everything else they used ! Great fun ! At the end of the day, Year 4 played their guitars alongside the old rocker Neil Young's music !